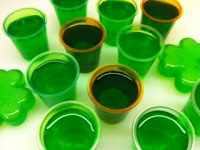 Regardless of how many years you're beyond 21, nothing brings a smile, smirk, or eye-roll to the face like a green jello shot. St. Patrick's Day brings out the ridiculous side in all of us (unless you live in Boston and then it's very, very serious). So why not commit to the holiday 100% and make a batch o' these. 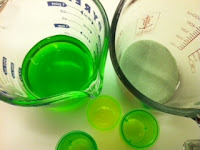 Directions Pour the green gelatin powder into a mixing pitcher and add 2 cups of boiling water. Let it simmer down for about 10 minutes, and then add 2 cups of Midori. Pour the liquid into shot glasses or even better, a silicone ice cube tray. Chill for 2-3 hours an serve.